A paper published by Ugandan scientist working at the BecA-ILRI Hub is the “most read” research article on an Oxford University Press journal for life sciences, the AoB PLANTS. Laban Turyagyenda’s article “Physiological and molecular characterization of drought responses and identification of candidate tolerance genes in cassava” was based on his research that aimed to identify genetic markers that could be used in breeding the crop for drought tolerance. Cassava is the staple food for more than 700 million people in over 100 countries and is not only the world’s fourth-most important source of calories, but it is also the second-most important source of starch for industry. The crop grows adequately under drought condition and its enhanced productivity could greatly increase the level of food security in such environments. The supervision of Turyagyaenda's PhD research was undertaken by Dr Jagger Harvey Senior Scientist, BecA-ILRI Hub and Dr Morag Ferguson, Molecular Geneticist, International Institute of Tropical Agriculture (IITA). Dr Ferguson is a member of the extended BecA-ILRI Hub Faculty whose expertise enables the Hub to support a broader and deeper range of research and capacity strengthening programs. Read Laban Turyagyenda’s personal account of his experience at the BecA-ILRI Hub: World class research in the heart of Africa. Communication of research findings in peer-reviewed journals is the standard by which scientists and their findings are evaluated by the scientific community. Publication ensures that research findings are accessible for use in related studies and are thereby better translated into agricultural improvement. To boost publication in international peer-reviewed journals by African scientists, the Biosciences eastern and central Africa - International Livestock Research Institute Hub (BecA-ILRI Hub), Australia's Commonwealth Scientific and Industrial Research Organisation (CSIRO), and The Nelson Mandela African Institute of Science and Technology (NM-AIST) will hold a workshop on scientific research paper writing at NM-AIST, Arusha, Tanzania on 18th-22nd November, 2013. The workshop is open to PhD students and early career agricultural researchers with a strong interest in improving their writing skills. Selected participants will benefit from intensive, interactive hands-on training, during which participants will develop their own manuscripts with the goal of submitting to a journal for publication within three to six months of completing the workshop. Participants should bring a project report for conversion to a paper, and/or the figures and tables and any other illustrative material that have been generated from data analysis. In order to fully benefit from this workshop, bringing a manuscript that is in an advanced stage of preparation is discouraged. The trainers conducting the workshop will be Dr Chris Beadle (Senior Principal Research Scientist, CSIRO Ecosystem Sciences) and Dr Peter Willadsen (Chief Research Scientist, CSIRO Livestock Industries) with support from the BecA-ILRI Hub. The workshop is funded by the Australian Agency for International Development (AusAID) through a partnership between CSIRO and the BecA-ILRI Hub; and by the Syngenta Foundation for Sustainable Agriculture, the Bill & Melinda Gates Foundation, and the Swedish Ministry for Foreign Affairs through Sida, the Swedish International Development Cooperation Agency. • There are several fully funded places at this workshop. However, applicants who can fund their participation have an added advantage. The cost of the workshop is $1500, excluding flights. Applications received after the 20th September 2013 deadline and incomplete applications will not be considered. Successful applicants will be notified by 7th October 2013. Please note that only successful applicants will be notified. Thank you in advance for considering this opportunity. We look forward to hearing from you. The Faculty for the Future program is growing each year and has become a powerful community of 323 women scientists from 63 countries. Grant recipients are selected as much for their leadership capabilities as for their scientific talents. Ultimately they are expected to return to their home countries to continue their academic careers, to further their research, to teach and to become inspirational role models for other young women. Candidates should have applied to, have been admitted to, or be currently enrolled in a university abroad when submitting their Faculty for the Future grant application. Candidates must hold an excellent academic record and illustrate their commitment to teaching and research or to using their scientific knowledge in public policy advocacy. Candidates should demonstrate leadership skills and have a track record in encouraging young women into the sciences. The Schlumberger Foundation is accepting applications for the 2014–2015 Faculty for the Future Fellowships from September 9th to November 15th, 2013 for new applications; from September 9th to November 8th, 2013 for renewal applications. Schlumberger Foundation is an independent nonprofit entity that supports science and technology education. Recognizing the link between science, technology, and socio-economic development, as well as the key role of education in realizing individual potential, the Schlumberger Foundation’s flagship program is Faculty for the Future. Copyright © 2013 Schlumberger Foundation. All rights reserved. 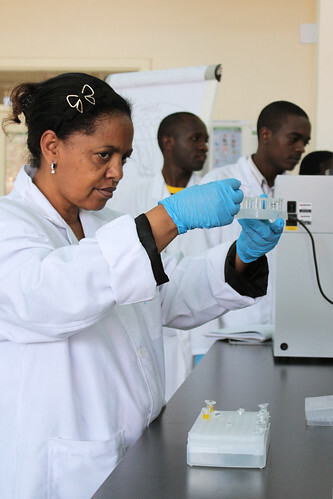 The BecA-ILRI Hub seeks to strengthen the capacity of the African scientific community, to conduct bioscience research and significantly contribute to improved agricultural products that can enhance livelihoods of farmers in the region. As part of its capacity building programme, the BecA-ILRI Hub in collaboration with the Swedish University of Agriculture Sciences (SLU), Sweden, will hold a training workshop on Advanced Bioinformatics from 7th – 18th October 2013. The workshop aims to provide a learning forum for researchers in bioinformatics, computational biology as well as scientists utilizing computational methods in their research. We are seeking applicants from eastern and central Africa who require advanced skills in Bioinformatics to support their research. We will select 25 graduate students and early career researchers, based on evidence of productive research and relevance of training to current research and who are engaged in agricultural research within a national research institute or university. Selected participants will attend an intensive 10-day workshop at the BecA-ILRI Hub in Nairobi, Kenya. The program includes comprehensive lectures and hands-on training sessions in Next generation sequencing technologies and it's applications to infectious diseases, metagenomics and microbiome analysis–tools and computational approaches to studying viral genomes. A team of creditable facilitators from the Swedish University of Agriculture Sciences (SLU), Sweden; South African Bioinformatics Institute (SANBI), South Africa; Université d'Aix-Marseille (AMU), France; the European Bioinformatics Institute (EMBL-EBI), UK; the Federal Institute of Technology, Zürich, Switzerland; Wellcome Trust, Kilifi, Kenya; Inqaba Biotechnical Industries Ltd, South Africa; and BecA-ILRI Hub (Kenya) will conduct the training sessions. A national of one of the BecA countries: Burundi, Cameroon, Central Africa Republic, Congo Brazzaville, Democratic Republic of the Congo, Equatorial Guinea, Eritrea, Ethiopia, Gabon, Kenya, Madagascar, Rwanda, São Tomé and Príncipe, Somalia, South Sudan, Sudan, Tanzania, Uganda..
Online application form completed by 22nd September 2013: http://hpc.ilri.cgiar.org/beca/training/AdvancedBFX2013_2/index.html. Applications received after the 22nd September 2013 deadline and incomplete applications will not be considered. Successful applicants will be notified by 30th September 2013. The workshop organizers will cater for travel and accommodation costs. Lunch and coffee breaks will be provided during the workshop. The workshop is funded by the Australian Agency for International Development (AusAID) through a partnership between Australia's Commonwealth Scientific and Industrial Research Organisation (CSIRO) and the BecA-ILRI Hub; the Syngenta Foundation for Sustainable Agriculture (SFSA); the Bill & Melinda Gates Foundation (BMGF); the United Nations Educational, Scientific and Cultural Organization (UNESCO); and the Swedish Ministry for Foreign Affairs, and the Swedish International Development Cooperation Agency. Thank you for considering this opportunity and we look forward to hearing from you. 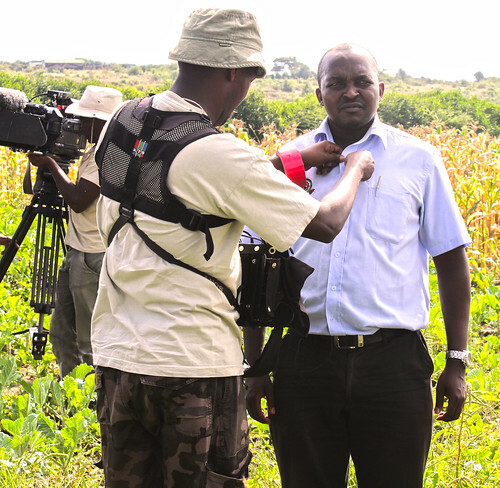 With support from the CGIAR Research Program on Climate Change Agriculture and Food Security (CCAFS) , the BecA-ILRI Hub recently highlighted the nutritional benefits and potential income gains to be made from growing and consuming amaranth on the Shamba Shape-Up TV show. This program that targets rural farmers with affordable and sustainable farm improvements is aired on Citizen TV in East Africa and has attracted an audience of over 11 million viewers. Loaded with unique nutritional properties, the amaranth, a hardy, drought tolerant crop commonly regarded as a weed in many parts of Africa, presents the opportunity of complementing the nutritional properties of starchy staples. This under-recognized and under-studied traditional crop is especially beneficial for pregnant and breastfeeding women as well as babies and children since its leaves are a good source of vitamins A, C, K and folate, while the grain contains high levels of protein containing essential amino acids, high dietary fiber content and minerals like iron, zinc and calcium. The BecA-ILRI Hub’s research on amaranth is funded by the Australian Agency for International Development (AusAID) through a Research for Development partnership with Australia's national science agency, the Commonwealth Scientific and Industrial Research Organisation (CSIRO) and the Hub. The partnership is focused on improving food and nutritional security, and animal health in the region as well as building the capacity of African scientists and national research institutes. The BecA-ILRI Hub capacity building programme seeks to strengthen the capability of the African scientific community to conduct bioscience research and significantly contribute to improved agricultural products that can enhance livelihoods of farmers in the region. As part of this programme, the J. Craig Venter Institute (JCVI) and National Institute of Allergy and Infectious Diseases (NIAID), USA, in collaboration with the BecA-ILRI Hub, will hold a training workshop on Advanced Bioinformatics from 22nd – 28th August 2013. The workshop aims to provide a learning forum for researchers in bioinformatics, computational biology as well as scientists utilizing computational methods in their research. We are seeking applicants from East and Central Africa who require advanced skills in Bioinformatics to support their research. We will select 25 graduate students and early career researchers, based on evidence of productive research and relevance of training to current research and who are engaged in agricultural research within a national research institute or university. Selected participants will attend an intensive 5-day workshop at the BecA-ILRI Hub in Nairobi, Kenya. The program includes comprehensive lectures and hands-on training sessions in Next generation sequencing technologies and it's applications to infectious diseases, metagenomics and microbiome analysis–tools and computational approaches to studying viral genomes. A team of creditable facilitators from JCVI, NIAID and BecA-ILRI Hub will conduct the training sessions. A national of one of the BecA East and Central African countries: Cameroon, Democratic Republic of the Congo, Ethiopia, Kenya, Madagascar, Rwanda, South Sudan, Sudan, Tanzania and Uganda. Online application form completed by 8th August 2013: http://hpc.ilri.cgiar.org/beca/training/AdvancedBFX2013/index.html. The course website can be accessed at: http://hpc.ilri.cgiar.org/beca/JCVI_NIAID_Bioinformatics_workshop/index.html. Applications received after the 5 August 2013 deadline and incomplete applications will not be considered. Successful applicants will be notified by 9 August 2013. Workshop participants will have to organize their own travel and accommodation costs. Lunch and coffee breaks will be provided during the workshop. The workshop is funded by the JCVI, Australian Agency for International Development (AusAID) through a partnership between Australia's Commonwealth Scientific and Industrial Research Organisation (CSIRO) and the BecA-ILRI Hub; the Syngenta Foundation for Sustainable Agriculture (SFSA); the Bill & Melinda Gates Foundation (BMGF); the Swedish Ministry for Foreign Affairs; and the Swedish International Development Cooperation Agency (Sida). 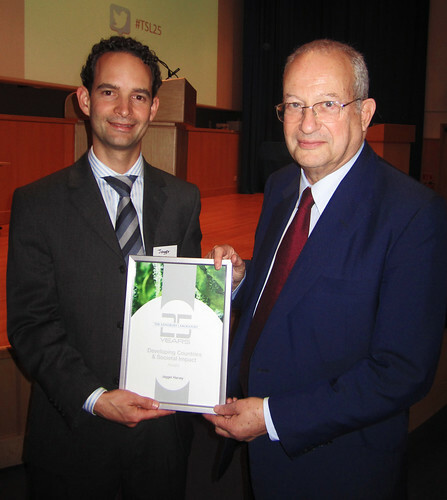 Dr Jagger Harvey was presented the prestigious Societal Impact Award by The Sainsbury Laboratory (TSL) in Norwich, UK. The award, one of four given to TSL alumni who have worked with developing country agriculture, was presented to Dr Harvey for his work at the BecA-ILRI Hub focused on research and capacity building. Dr Harvey conducted his postdoctoral research at TSL from 2005 – 2008 with funding from the US National Science Foundation, before joining the BecA-ILRI Hub as crop research scientist. He is currently the Principal Investigator in the multi-disciplinary, multi-national team project - Capacity and Action for Aflatoxin Reduction in Eastern Africa (CAAREA) – which is seeking to develop strategies for the control of aflatoxin contamination food and feed in eastern Africa. Dr Harvery received the award during the 25th anniversary celebration of TSL on June 24th, 2013 during which he also delivered one of the keynote presentations on "Research for development in African agriculture". The Sainsbury Laboratory, located at the John Innes Centre, is a leading institute focused on understanding molecular plant-microbe interactions. Watch the TSL 25th Anniversary video (http://www.youtube.com/watch?v=yTk-3GAXlUQ). From 24th June to 5th July 2013, the BecA-ILRI Hub is hosting a training workshop on the use of the newly installed Illumina genome sequencing machine (MiSeq). The training conducted by Claudia Hasche, a senior field application specialist from the Alliance Global Group includes both wet-lab sessions as well as a number of presentations describing the MiSeq system and its different applications. A first of its kind in the eastern Africa region, the MiSeq will enable the BecA-ILRI Hub genomics platform better meet the expectations of emerging research, capacity building and services demands in the BecA region and beyond. The Illumina MiSeq will significantly increase the capabilities of the genomics platform reduce sequencing costs. 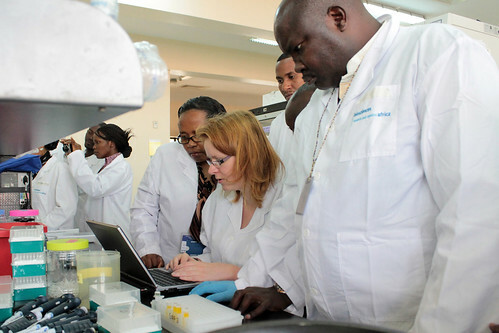 “I am really excited about the possibilities this new sequencer presents,” says Francesca Stomeo a genomics scientist at the BecA-ILRI Hub who played a key role in organizing the workshop. “The MiSeq is more user-friendly, it is faster and it is less expensive to operate than other next generation sequencing platforms. Among the scientists in the region who will have access to the new sequencer for their crop and livestock disease diagnostics research are Joseph Ndunguru, principal scientist at the Mikocheni Agricultural Research Institute in Tanzania for his work on cassava viruses; ILRI Biosciences teams working on animal disease diagnostics; scientists from the International Institute of Tropical Agriculture (IITA) in Kenya, Uganda and Tanzania; scientists from the International Potato Center; as well as scientists from various other CGIAR centers and National Agricultural Research Institutions. The use of the sequencer by these researchers will be supported through a grant received by the Hub from the Illumina Agricultural Greater Good Initiative. The machine was acquired with funding from the Swedish Ministry for Foreign Affairs through the BecA-Sweden partnership on food security. The partnership was developed to support food and nutritional security in the BecA sub region and enhance individual and institutional capacity building in the biosciences. The BecA-ILRI Hub is delighted to welcome five new team members. The BecA-ILRI Hub’s annual “Introduction to Principles in Laboratory Management and Equipment Operations Workshop” kicks off on Monday 17th June 2013. This year’s workshop will be conducted at the Holetta Agricultural Research Centre, Addis Ababa Ethiopia. The course was designed to address the operational gaps that exist in managing research facilities in Africa. The intensive 5-day workshop will introduce participants to principles in biosciences laboratory management and equipment operations including compliance with legal and regulatory frameworks for health and safety, waste management, import and export of biological materials and biosafety. Participants to this workshop are drawn from individuals managing research laboratories in the eastern and central African region. Dr. Appolinaire Djikeng has been named as the new Director for the BecA-ILRI Hub. Having first come to ILRI, Nairobi as a PhD student in 1995 and more recently serving as the BecA-ILRI Hub’s technology manager and interim director, Appolinaire began his new appointment on 12 June, 2013. After spending close to 11 years working in prestigious institutions in the US such as the Yale University School of Medicine and the J Craig Venter Institute, Appolinaire was keen to return to Africa. His dream was to see Africa participate in the global scientific community at the same level as other communities, and he desired to make his contribution through building the capacity of African scientists to use tools of modern biology. Considered for years the “poor man’s crop”, cassava, a staple food for more than 700 million people in over 100 countries, is not only the world’s fourth-most important source of calories, but it is also the second-most important source of starch for industry. According to Dr Claude Fauquet, plant virologist from the International Center for Tropical Agriculture (CIAT) and Director of the Global Cassava Partnership for the 21 Century (GCP21) , the starch from cassava, is used in hundreds of products including flour, syrup, paper, glue, food additives and animal feed. Cassava starch is the most widely traded starch in the world and is vital cash crop for millions of smallholders in Asia and Latin America. “Cassava as an important climate change resilient crop with a potential for increased yield of up to 200%, in Africa alone, over the next 20 years” said Dr Fauquet during his presentation at the BecA-ILRI Hub on Monday 10th June, 2013. “The challenge in making this potential a reality is in the investment of advanced research and technology for better production systems, improved processing and better market management”. As a consortium bringing together different players in cassava production, processing and trade, the GCP21 is steering various stakeholders in cassava toward a more concerted approach to cassava improvement globally. By connecting over 3000 scientists, 105 national research institutions, 45 international research institutions, funders and the private sector GCP21 hopes to unlock cassava’s potential for food, animal feed and industry. The Biosciences eastern and central Africa – International Livestock Research Institute (BecA-ILRI) Hub and the Bill & Melinda Gates Foundation (BMGF) will host three Agricultural Research Connections (ARC) Workshops in July and August 2013 in Nairobi, Kenya. These unique workshops will bring together scientists based within and outside of sub-Saharan Africa to foster scientific collaborations with the potential to create new pathways out of poverty for African farming families by addressing issues related to the crops and livestock on which they depend. In addition to learning about agriculture in Kenya, participating scientists will be given the opportunity to describe their own areas of expertise and explore with other workshop participants possible collaborations that could contribute to the advancement of agriculture in sub-Saharan Africa. More information on the PEARL program will be available on the www.gatesfoundation.org website under 'Current Grant Opportunities' by mid-May 2013. For the PEARL program, pre-proposals led by scientists in African national programs will be accepted between mid-May and late September 2013. To be considered, pre-proposals for PEARLs will include international collaboration. To facilitate such collaboration, we are now accepting applications to attend the 2013 ARC Workshops. Please note that attendance of the ARC Workshops is not a requirement to submit a PEARL pre-proposal. ARC Workshop participants will tour regional laboratories and facilities, visit local farmers, and engage in discussion sessions in Nairobi and the surrounding area. Sessions will include presentations on agricultural challenges in Africa. We expect participants to play an active role in seeking and developing new research partnerships, including developing proposal outline ideas for future competitive funding opportunities. Participants for the ARC Workshops will be selected based on criteria including scientific excellence (for career stage), and potential for developing collaborative projects relevant to Africa. Prior international experience is not required and first-time visitors to Africa and early career scientists are especially encouraged to apply. We hope to include scientists from a range of disciplines related to crop, soil and livestock sciences, with varying levels of experience, transformative ideas, and a shared passion for the potential of science to alleviate poverty among smallholder farming families. Although we are well into 2013, we would like to take this opportunity to share with you the excitement of the great successes accomplished in 2012 by the BecA-ILRI Hub team and our partners. The year 2012 was indeed very significant for the BecA-ILRI Hub, all our friends and partners on many accounts, the most important being that the BecA initiative turned one decade old. A lot of progress has been made over these 10 years and we believe there are prospects for even greater achievements in the years to come. It has been a privilege and an honor for all us at the BecA-ILRI Hub, working with you, our partners in mobilizing biosciences for Africa's development. I invite you to read the attached 2012 Biosciences eastern and central Africa annual letter which expresses our conviction that the BecA-ILRI Hub has and will continue to play a critical role in propelling Africa towards a bright future. Capacity Development, Technology and Knowledge Transfer Initiative: a joint agreement between Nelson Mandela African Institute of Science and Technology (NM-AIST) and the Biosciences eastern and central Africa–International Livestock Research Institute (BecA-ILRI) Hub, 14th March 2013. The Nelson Mandela African Institute of Science and Technology (NM-AIST) and the Biosciences eastern and central Africa- International Livestock Research Institute (BecA-ILRI) Hub signed a formal letter endorsing a partnership between the two institutions on March, 14, 2013. The partnership will see both institutions benefit from each other’s resources and scientific knowledge. The signing of the letter of agreement for the Joint Capacity Development, Technology and Knowledge Transfer Initiative took place at the NM-AIST campus in Arusha, Tanzania. The NM-AIST and the BecA-ILRI Hub have a shared vision of driving Africa’s development through the empowerment of African scientists to engage in cutting edge research. Through the partnership, the institutions will share skills, technologies and facilities to enhance their research and capacity building programs via exchange visits by researchers. The institutions will also conduct collaborative agricultural biosciences research aimed at addressing food safety and security in the region. 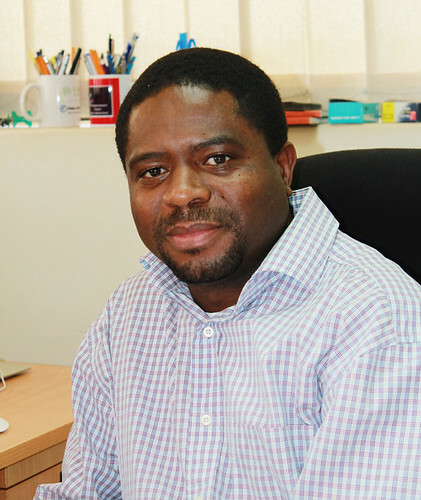 As an initial implementation of the agreement, Dr Morris Agaba, professor at NM-AIST School of Life Sciences and Bioengineering, will take up a joint appointment with the BecA-ILRI Hub. Dr Agaba will provide overall leadership of a project entitled “Harnessing genetic diversity for improving goat productivity in Africa” which brings together partners from Cameroon, Ethiopia, Kenya and Tanzania. “The establishment of the First Research Chair is the beginning of great achievements to be realized though this partnership” said Prof. Burton Mwamila. Other areas of collaboration will include exchange of Adjunct Faculty members, organization of joint technical meetings & workshops, various joint training courses and the co-funding of scientists to conduct research at the BecA-ILRI Hub. “There are many more opportunities for collaboration in research and capacity building” said Dr. Djikeng. “We shall continue to explore ways to further strengthen the partnership between these two institutions”. Partnerships between scientists in and outside Africa are an integral part of research geared towards achieving food security on the continent. In Kenya, the Arbovirus Incidence and Diversity Project (AVID ) brought together (icipe), Kenya Medical Research Institute (KEMRI ); Kenya Wildlife Services (KWS); Department of Veterinary Services; Ministry of Public Health and Sanitation; and the International Livestock Research Institute (ILRI ) to improve the prediction and prevention of rift valley fever (RVF) and other emerging arboviruses that have serious health and economic implications on animal husbandry in Africa. Initiative. In San Diego, USA to receive the award was the BecA-ILRI Hub Director (interim) Dr Appolinaire Djikengwho says “such initiatives are the key to bringing Africa out from the shadow of poverty and food insecurity”. Nairobi, Kenya, for scientists and students from African national research institutes and universities. The BecA-ILRI Hub provides a common biosciences research platform, research-related services and capacity building opportunities to eastern and central Africa and beyond. The Hub increases access to affordable, world-class research facilities, while creating and strengthening human resources in biosciences and related disciplines in Africa. These activities focus on addressing key constraints in African agriculture. Other innovative ideas that could potentially lead to major breakthroughs. A national of one of the BecA-ILRI Hub countries: Burundi, Cameroon, Central Africa Republic, Congo Brazzaville, Democratic Republic of the Congo, Equatorial Guinea, Eritrea, Ethiopia, Gabon, Kenya, Madagascar, Rwanda, São Tomé and Príncipe, Somalia, South Sudan, Sudan, Tanzania and Uganda. Completed online application form and uploaded CV and research project concept note. Funding for travel, accommodation, medical insurance, and some research expenses at the Hub will be provided. Please note that funding for research at the applicant’s home institute or field work is not provided under the ABCF Fellowship programme. As some of you already know, I am leaving the BecA Hub and ILRI at the end of November, 2012 after five and half years as the BecA Hub Director. This is also a departure from the CGIAR after over 20 years of service, 15 of these at CIAT in Colombia. I will be joining the Alliance for a Green Revolution in Africa (AGRA) as their Vice President – Programs on 01 December, 2012 (http://www.agra-alliance.org/).